There are several unique communities within a short driving distance of Kansas City that have rich, wonderful histories, one-of-a-kind shops and tasty restaurants and are great options for groups to explore on a day trip. To explore Atchison, KS, take I-29 north from Kansas City to exit 20 and follow Missouri Highway 273 to Missouri Highway 45. Go North on Highway 45 to U.S. Highway 59. Take U.S. Highway 59 West four miles to Atchison. See below for our best bets, or visit http://www.atchisonkansas.net. On July 24, 1897, aviatrix Amelia Earhart was born in this home, built by her grandfather in the early 1860s. It is owned and operated as a museum by The Ninety-Nines Inc., an international organization of women pilots. Earhart helped found the group in 1929 and served as its first president. Recent renovations have returned the birthplace to its condition at the turn of the century when Earhart lived here with her grandparents. Located in the restored Santa Fe Depot, this museum traces the history of the region. Exhibits highlight Atchison’s transition from a bend in the Missouri River to a busy commercial center for steamboats, westward-bound wagon trains and the railroads. Highlights include a display of Amelia Earhart’s personal effects, a large collection of rare guns dating back to the Revolutionary War and displays on the Lewis & Clark expedition. Guided tours available upon request. Adjacent to the Santa Fe Depot, the Atchison Rail Museum is owned and operated by the North East Kansas Railroaders, Inc., a voluntary group of railroad enthusiasts. It features an outdoor collection of rail cars and is available for exterior viewing throughout the year. NEKR members operate the Atchison & Western Miniature Railroad, a 12” gauge railroad, weekends during the summer. Museum cars are open summer weekends. Recently renovated and updated, this 25-room mansion is a glorious example of the opulence of the Victorian era. Built in 1882, it is distinguished by a three-story castle-like tower. Ornate fireplaces, carved woodwork and original chandeliers mix with Victorian furnishings. The carriage house features a gift store and a small theatre in which a film on the architecture of Atchison can be viewed. Hours and days of operation vary depending on season. Guided tours are available. Parquet floors, stained-glass windows, hand-tooled leather and finely-carved woodwork make an impressive backdrop for displays of art by regional and national artists. A lumber merchant built this spectacular Queen Anne-style mansion in 1887 – 1888. 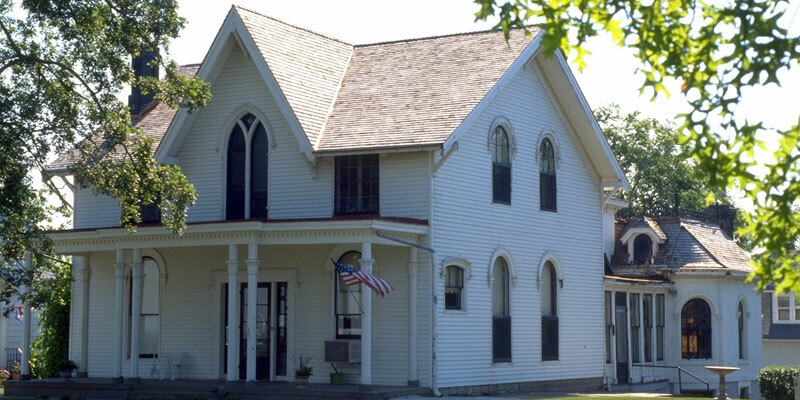 The Muchnic family bequeathed the home to the community to be used for art purposes. The first floor is furnished as it was when the Muchnics lived here in the early 1900s. Art exhibits are displayed on the second floor from March through December. A life-size bronze statue of Amelia Earhart gazes over the International Forest of Friendship, which is a living, growing memorial to those who have been involved in aviation and space exploration. The forest was established as a bicentennial project by the City of Atchison and The Ninety-Nines Inc., an international organization of women pilots. Each June, new honorees are inducted into the forest with plaques embedded in the walkway that winds through trees representing all 50 states and over 35 countries in which forest honorees reside. Guided tours available for groups by special arrangement. Benedictine monks established St. Benedict’s Abbey in the late 1850s. About 40 monks reside at the abbey, which was completed in 1929. The church was designed by a student of Frank Lloyd Wright and was completed in 1957. It features a 44-foot-high nave ceiling, facing choir stalls where monks gather three times a day for common prayer and unique frescoes. Self-guided tours. The Benedictine Sisters of Mount St. Scholastica have been in Atchison since 1863. St. Scholastica Chapel is rich with beautiful marble, a large rose window and stained-glass windows honoring seven martyred women saints. A vaulted ceiling graces the interior of the choir chapel, which has facing choir stalls and stained-glass windows retelling the life of St. Benedict. Guided tours of the chapels and a religious history room are available with advanced appointment.